After last week’s well-researched post on beer, I was more than ready for a little pick-me-up this week. So, as I was brewing my cup o’Joe this morning, I thought I’d talk a bit about coffee. Specifically, Kona coffee! I’d wager quite a bit that at least one co-worker or sister-in-law asked you to bring back Kona coffee from your vacation—am I right? So, what is it, anyway? And how do you know if you’re getting the good stuff? And, really, what’s the big deal? Hopefully, I can help you navigate the coffee scene while you’re here in Hawaii, and point you in the right direction for a perfect cup of Kona! The one-of-a-kind growing conditions in Kona make for a highly prized cup of coffee. 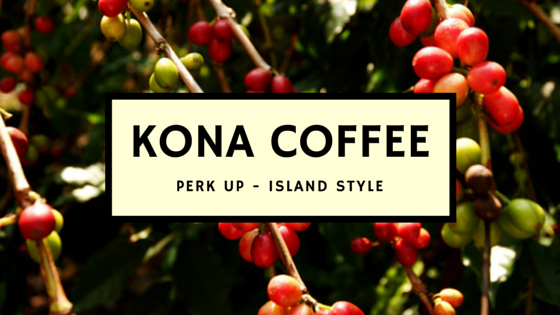 Kona coffee is certainly “top-shelf” in the coffee world. 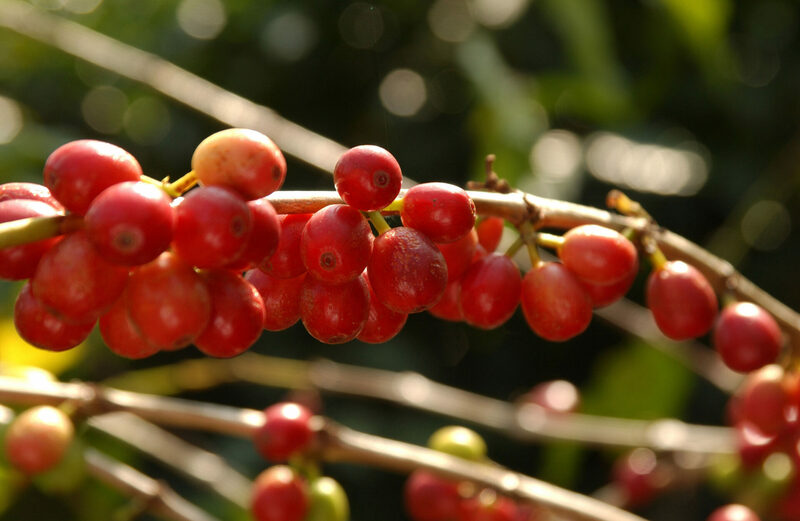 Kona coffee beans are descendents of Guatemalan plants, so they share similar (but not identical) flavor qualities with Central American brews. The flavor can vary from farm-to-farm, and Kona coffee growers are constantly experimenting with different techniques and plant hybrids, so it’s tough to pin down exactly what Kona coffee tastes like. It’s a bit like asking someone to explain what New Zealand wine or Chinese tea tastes like! However, in general, Kona coffee will have a light amount of acidity, a little fruity sweetness, and a darkly toasted nut flavor. For coffee lovers worldwide, a cup of Kona is quite a treat. You can find Kona coffee in almost every store in Hawaii, but before you fill your cart with the cheapest one you can get your hands on, beware: it may not be 100% Kona coffee. Plenty of retailers sell “Kona blends,” which may contain as little as 10% Kona Coffee. They’re not legally obligated to disclose what the rest is, so you may be drinking a cup of 90% cheap, over-roasted, not-so-quality beans. Look for “100% Kona,” and ideally, a specific grower or farm on the label. If you’re not buying it in Kona, be diligent about reading the whole label before you purchase. Stop by a specialty coffee or gourmet shop, and ask a knowledgeable employee to walk you through your Kona choices. So, you’ve bought it, now what? First, keep an eye on the expiration date, and try and use it well before that date. Stale coffee is no good. Also, are you the type to store your coffee in the fridge? Please don’t! The moisture in the refrigerator is terrible for your beans. The enemies of flavor are light, moisture, temperature, and air. Store your Kona in an air-tight container in a cool, dark, dry area—a cabinet or pantry is perfect. Finally, make sure you grind it as you need it—not all at once. If you don’t have a coffee grinder, and have to grind the whole bag, be sure to use it within a week. A pound or two of good Kona beans may cost you more than you’ve ever spent on coffee, but it’s certainly worth the splurge, especially if you’re a coffee connoisseur. It’s a wonderful way to bring home the flavor of the Islands, and share it with friends while you’re showing off your pictures and sharing your stories from your trip to Hawaii. Pineapples. Kona coffee. Fresh fish. Your list of island flavors is just waiting to be devoured. What else is on it? If one of your answers isn’t “beer,” then you may be missing out. Plenty of hops-hungry travelers indeed come to the islands to sample some of our tastiest brews, and if you want to take part as well, here are some of the best local breweries and beers to check out while you’re here! Kona Brewing Company is arguably the most famous—and most widely-sold—local Hawaii beer. For good reason, too! Not only are their products consistent and delicious, but they’re a great presence in the community as well. They’re totally committed to reducing their carbon footprint; they even collect the evaporated water back into whiskey barrels, and then it’s used for landscape irrigation. They also offer support and donations to many local and national charities, and sponsor sporting events around the islands. Okay, that’s all amazing, but how’s the beer? Try it for yourself—and you will be happy you did! Find their flagship beers all over Hawaii: look for (among others) Longboard Lager, Castaway IPA, and, my personal fave, Wailua Wheat. It’s a crisp, wheat beer that’s subtly infused with passionfruit flavors, and it’s perfect to sip on a sunny Maui afternoon. Bonus points for their packaging: it’s colorful, artfully done, and has a sort of retro-Hawaii feel about it. The best part? Under each bottle cap is a different Hawaiian word or phrase—we love an educational beer! Another Big-Island brewery, Mehana has been making delicious local beer since the nineties. Even though they were purchased by Hawaii Nui Brewing Company, they keep their original name on their original beers. They started in the former Hilo Soda Works facility, and keep a local spirit in the naming of their beers. Look for Mauna Kea Pale Ale, Tsunami IPA, and Hawaiian Crow Porter, which takes the cake for my favorite local dark beer. It’s smooth, dark, and malty, and goes great with a nicely grilled steak. Look for Mehana’s silver cans with their signature cartoony labeling, and enjoy! This home-grown brewery is becoming quite the Maui institution, with the opening of their second state-of-the-art brewery in Kihei. They have a location in Lahaina, as well, and both breweries feature tours and tasting rooms. Want more than a taste? Hit up their Brew Pub in Kahana, and spend the afternoon sampling their huge selection of local, unique beers. Its wood furnishings, crazy-high ceiling, and chalkboard menu give it a modern, friendly feel. It has one out-of-this-world feature that I totally love, though: an “ice rail” on the bar! That’s right—when you’re between sips, sit your beer on the frosty rail running the length of the bar, and you won’t have to worry about the last sip being warm. Nice! While their Brew Pub features a rotating selection of exclusive drafts, you can find their canned beer all over the islands as well. Be sure to try their Bikini Blonde Lager, CoCoNut Porter, and, my hands-down favorite beer of all time, Big Swell IPA. “Hoppy” doesn’t begin to describe the crisp, slightly fruity, and super sharp flavor bursting from the un-missable royal blue can. If you’re an IPA connoisseur, put this on your beer bucket list! More breweries are in the works on several different islands, so watch out for even more bubbly island goodness in stores and bars across Hawaii. Not a beer drinker? Keep an eye out for a future blog post featuring local spirits—another perfect way to toast to a celebration, a vacation, or just pau hana on Aloha Friday! If you’ve spent a few minutes checking out our website, I’m sure you’ve seen our “Hana Sky-Trek” page. As our most popular tour, we host thousands of people every year on our exclusive Helicopter/Limo-Van combination. As you’d expect, we get a lot of questions about it too, so I’ve compiled a list of our most frequently asked queries about our famous Hana Sky-Trek. What are the tour start-times? What’s the difference? We offer check-in times at the Kahului Heliport at 7:00 AM and 11:15. The 7:00 AM tour starts with the drive to Hana, continues with a Pacific Rim Cuisine picnic lunch at a black-sand beach, and concludes with a 36-minute helicopter tour of both Hana and Haleakala. It returns to the Kahului Heliport by around 1:15 PM. If you choose the 11:15 tour, it’s the same deal, but just in the reverse order. Your tour begins with soaring over mountains, cliffs, and waterfalls during your 36-minute helicopter tour. You’ll touch down in Hana, and then meet your Tour Guide for your Pacific Rim Cuisine picnic lunch at a beautiful black-sand beach. After a tour of Hana Town, you’ll make the journey on the famous Road to Hana back into Kahului. The PM tour finishes back at the Kahului Heliport by around 5:15 PM. What stops are included on the road portion of the tour? 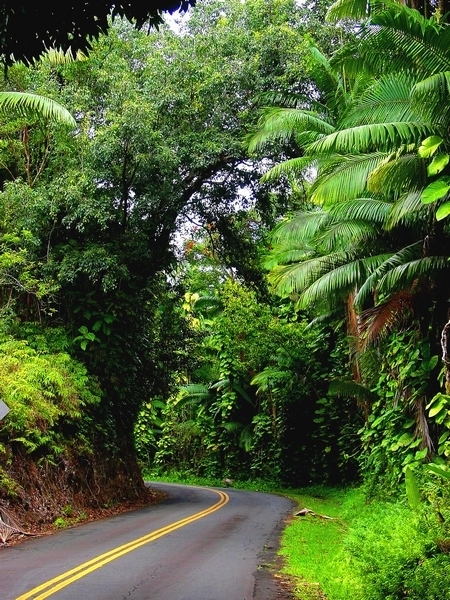 Travel the world-famous Road to Hana without taking a whole day out of your vacation! While each small-group, luxury tour is different, each Hana Sky-Trek will include stops at Keana’e peninsula, Kaumahina State Park, Pua’a Ka’a State Park (where you’ll enjoy a swim under a fresh, natural waterfall), an exclusive tour of a Hana tropical flower farm, and Waianapanapa State Park. Enjoy other stops during your journey as well, for photo opportunities, those famous Hana banana bread stands, and just to stretch your legs and explore East Maui’s undisturbed beauty with your Hawaii Certified Tour Guide. Each Hana Sky-Trek accommodates a maximum of six guests. When you travel with us, you’ll be spending your day with not only a licensed, experienced Tour Guide, but also with other like-minded, discerning travelers who are looking to get the most out of their Maui vacation—and settle for nothing but the very best. How long is the drive from my hotel to the Kahului Heliport? If you’re traveling from Lahaina, Ka’anapali, or Kapalua, allow about an hour to reach the heliport. If you’re staying in Kihei, Wailea, or Makena, allow about forty-five minutes. If you’re staying somewhere else, give us a call, and we’ll let you know the best way to get there. For your Hana Sky-Trek, wear comfortable clothing and shoes that are suitable for walking on natural terrain. You won’t be doing any real “hiking,” but sand, rocks, roots, and other features of a natural environment abound, so you’ll need something more than sandals or flip-flops. Tennis shoes or sneakers are perfect. If you want to take advantage of a swim stop, bring a swimsuit and towel—there are places to change along the way. You might want to bring a light jacket or sweater as well, just in case your tour passes through some cooler weather in the rain forest. Finally, if you’re prone to motion sickness, bring some ginger candy or another natural remedy that won’t make you drowsy. Our Tour Guides do their very best to minimize any discomfort, but with 617 hairpin turns along the road, it can be unavoidable for some folks. Other than that, we take care of the rest! Your tour guide will provide ice-cold bottled water and tropical fruit juices throughout the day, and we serve a delicious Pacific Rim Cuisine picnic lunch during your tour. If it rains (and, it is the rain forest), your Tour Guide will provide a premium umbrella so you won’t miss a moment! Is there a weight limit on the helicopter? Yep! For safety reasons, we ask you to provide your accurate body weight when booking your tour, so the helicopter company can plan the proper weight distribution for each flight. When you’re packing your carry-on bag (with your swimsuit, towel, and jacket), keep in mind that the helicopter company asks that you limit it to three pounds per person. Your camera is weighed with you, not your bag, so it’s not included in that three-pound guideline. What if someone in my party has special dietary needs? We can accommodate almost any dietary considerations, including vegan, vegetarian, and gluten-free. We work with an extremely professional caterer who can easily adjust your meal to suit your needs. We are unable to provide certified Kosher meals at this time, so let us know if you plan to bring your own Kosher meal. Can we get a DVD of our helicopter tour? 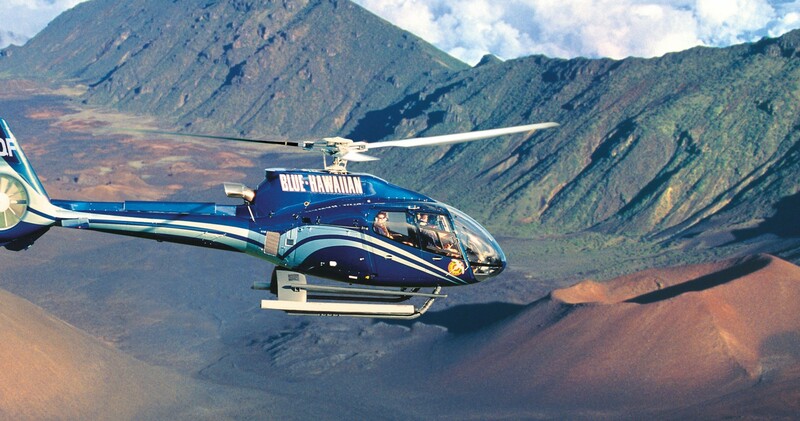 A helicopter tour over both Hana and Haleakala is an unforgettable experience. If you return to the heliport while the helicopter company is still open, go ahead and purchase one right there. Otherwise, we can provide you their phone number to get in touch with them afterward. It’s a great way to remember one of the highlights of your time on Maui. My family wants to do the Hana Sky-Trek, but I’m terrified of the helicopter! What should we do? We partner with top-notch helicopter tour providers with excellent safety records. All of the helicopter pilots are also Hawaii-Certified Tour Guides, and are just as passionate about their work and the safety of their guests as our Guides are! So, rest assured, you’re in excellent hands. If you’re still wary, just remember: you’ll be too busy being awe-struck by towering waterfalls, huge cliffs, crashing surf, and the moon-like surfaces of Haleakala Crater to even remember to be nervous. It’s a smooth, safe ride that virtually all of our nervous guests have thoroughly enjoyed. I loved every minute of my tour! Where can I write a review? Awesome! 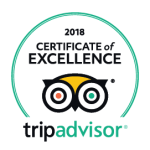 If you want to share your experience with other travelers, please consider leaving us a review on Yelp, TripAdvisor, or our Facebook page. We love hearing from you, and will be sure to point out your review to your Tour Guide, who will be thrilled to read it as well! These are just some of the most common questions we hear about our Hana Sky-Trek. Got something else to ask? 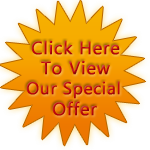 Email us, call us at 1-800-817-1234, or drop us a line on Facebook. We’ll be in touch, and we can’t wait to share our most popular adventure in paradise with you and your friends and family! Like I’ve mentioned before, when people think of Maui, they don’t automatically think “shopping.” Oahu certainly takes the cake when it comes to big malls, outlet centers, and big-name chain stores. While things are certainly changing on Maui (Target is having its grand opening as I write this), it still doesn’t compare to Oahu when it comes to the sheer amount of shopping there is to do. It does, however, make up for it with the quality and uniqueness of what it offers. If you do want to indulge in a little retail therapy while you’re on vacation, here’s where you’ll find what you’re looking for—and more! 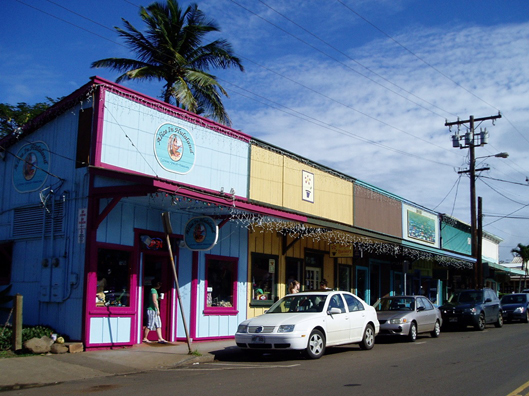 A funky color scheme in Paia takes a fun day of shopping to a whole new level. I’ve written in depth about nearby Makawao already, but shopping in Paia is a completely different experience. With a younger, hipper, and funkier vibe, Paia is where the free-spirit fashionista goes to play. From eclectic boutiques to designers’ own shops, you can find that “Where did you get that?” look with a day of strolling down the shop-lined streets. Some suggestions: Check out Nuage Bleu for their incredible jewelry and cute kids’ items, Biasa Rose for more stylish apparel offerings than you can imagine, and Paia Trading Co. for the quirkiest antiques ever. And trust me—picking just three spots in this shopping-dense town was difficult. You can easily make a day of it—especially since Paia boasts some of the best dining on Maui as well! Make your way down Front Street in sunny Lahaina to find shop after shop of unique items! My husband’s family lives in Lahaina, so we make the drive from Wailuku pretty often. When we do, though, I’ll admit there’s usually just one thing on my mind: retail. 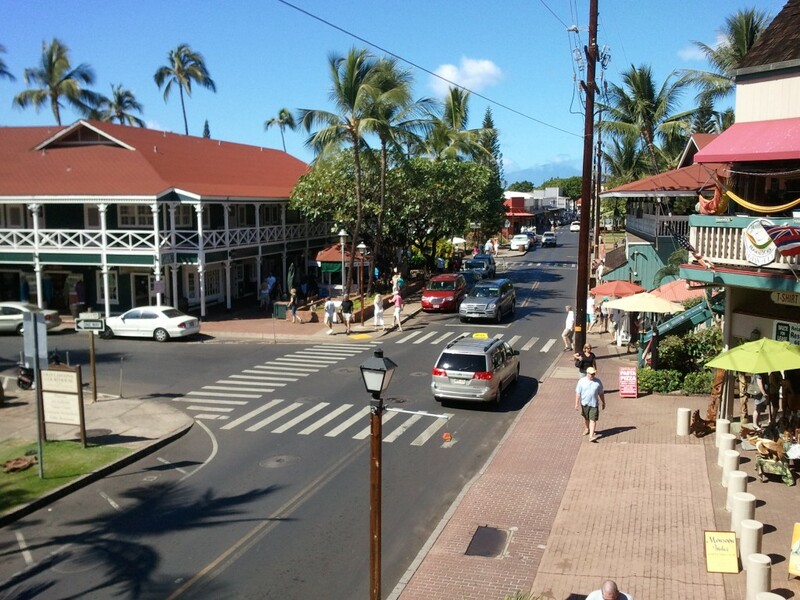 It’s home to Maui’s only major bookstore, a huge high-end outlet center, and countless souvenir shops, galleries, and boutiques on world-famous Front Street. This is another area where you can easily spend a whole day, and leave with a trunk full of shopping bags. While it features major retail chains like Barnes & Noble, Lush, and Gap Outlet, you’ll find plenty of unique spots around town as well. My picks? Banana Wind in the Cannery Mall, where you’ll find gifts, jewelry, and home items that you can’t live without; Célébrités Gallery, starring art and mementos both featuring and created by—you guessed it—major celebrities; and Serendipity, where you can get your fix of pretty, flowy dresses and sarongs to keep that island mood alive even when you’re back on the mainland. The unique architecture of Queen Ka’ahumanu Center is an attraction all to itself! It’s awesome to check out all the quirky, unique, and higher-end shops that make their home on Maui, but what if you just landed—and your luggage didn’t? Or you need sunscreen, potato chips, or a phone charger? Kahului has what you’re looking for. Close by to the airport, you’ll find Costco, Walmart, K-Mart, and the aforementioned Target. Queen Ka’ahumanu Center, Maui’s biggest mall, houses big-name stores like Macy’s, Champs, Forever 21, and even every major wireless carrier. Even if you’re just in the mood to shop, but aren’t ready to spend a ton, a day in Kahului should take care of that urge. It’s where most of Maui’s local residents live, work, and shop, so you won’t find the higher prices that more tourist-centric areas might charge. And hey—don’t think that it’s just major retailers in Kahului! While you’re in town, drop by Blue Ginger in Queen Ka’ahumanu Center for pretty, floral local fashions; Hawaiian Island Creations at Maui Mall for surf-inspired young adult fashions; and Tamura’s on Dairy Road for a gigantic selection of wines, liquors, gourmet foods, and fresh Hawaiian poke! There’s something to be found pretty much wherever you are on Maui, and if you want to spend a day indulging in retail therapy, it’s definitely not hard to do. Whether you’re looking to get your hands on the latest designer goods, or deck yourself out in funky, island-made jewelry, Maui is the place to go for variety, selection, and customer service with aloha that will make your shopping experiences unforgettable.